Man Utd striker Marcus Rashford has revealed which three Premier League strikers he admires most outside of the options at Old Trafford. The 21-year-old is having a big season this year, scoring 12 goals and providing nine assists in 38 appearances for the Red Devils. The appointment of interim boss Ole Gunnar Solskjaer in December has seemingly had a major influence on his impact for the team, perhaps with the United legend giving him tips and help in training on how to improve his goalscoring. 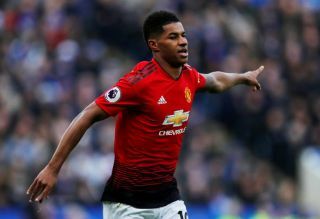 Coupled with gaining experience, maturity and developing his all-round game, Rashford is undoubtedly making strides in the right direction, and he’s clearly trying to learn from some of the best in the business. As noted in his comments below, the Man Utd forward revealed which three strikers he most admires in the Premier League, with a Manchester City star getting top spot. “I think, probably the most all-round centre forward, is Sergio Agüero,” he told GQ Magazine. “Even on an off day, he can score you three or four goals. That, for me, is one trait of a centre forward that I would take all day long. When you’re not having a good game, but you’re still scoring goals. That is a skill on its own. Meanwhile, Rashford was also asked about the former Man Utd players he looked up to and admired the most, and naturally he provided a list of club heroes from previous generations who all undoubtedly left their mark at Old Trafford and wrote their names in the history books. A product of the Man Utd youth academy, Rashford clearly knows his history and he’ll be hoping that he can add consistency and more quality to his play to ensure that his name is included in that list in years to come.